On May 13 the Coastside County Water District published a proposal to increase water rates by about 15%. Here is a spreadsheet and a graph showing the present and proposed rates and the water bill that will result. Here is the URL to the spreadsheet. The website is Google Docs. I presume you can download the spreadsheet and open it in Microsoft Excel. I developed the spreadsheet using Gnumeric, which is a free and open source spreadsheet that matches Excel. The rate increase proposed is a straightforward extension of a conventional utility rate structure. The classic utility price model is a fixed cost levied on all users and a variable cost levied for each unit of the utility subject delivered. Now how might we tilt this price structure to facilitate Coastside residents to continue moving a desirable future relationship with our use of water? 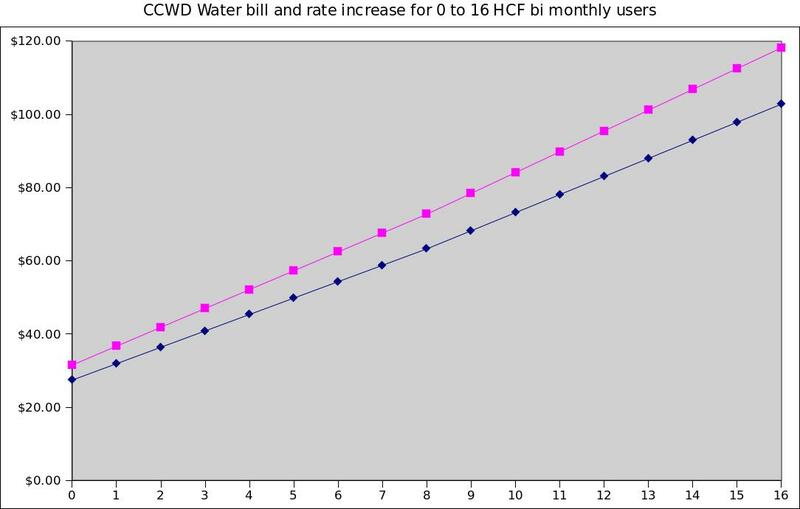 How much does each HCF of water you use cost as the amount of water you use bimonthly declines? Typical usage in a family of 3 is 9 HCF per billing period. The graph shows the cost of each unit of water increases as one ventures into the low monthly usage class. Note, the spreadsheet and graphs show costs for a two month billing interval. CCWD reads water meters on a bi-monthly basis. For people who use 6 HCF or less of water in a two month billing period, the fixed part of the water bill called “the bimonthly base charge” becomes the dominant part of their water costs. Who are the 6 HCF and less users? The below 6 HCF group probably includes the single, the unemployed, those living 4 days a week out of the house to avoid commute costs, and home owners and investors selling or leasing a Coastside home in this very slow real estate market. If you have a vacant house that uses only 1 HCF bimonthly, then it is not that hard to pay a $10.30 water bill several months in advance. The home owner gets the fire fighting value of a working water connection and CCWD gets a little chunk of cash and the water meter reader can skip reading the water meter.